This article was written some years ago by one of our ex-members, Dennis Bradley. It has been edited in parts to bring it up to date, but the bulk of the article is original. In order to build a successful model railway, it will be essential that you have a certain amount of electrical expertise. It is one of the most important and probably one of the least understood areas of the hobby. This short article will help you to understand some of the basic principles that will assist you to develop your skills, in order to produce a working layout. The objective of the hobby is to create and operate a model railway system, in which the owner derives enjoyment from working points, signals and trains. There has always been scope for some degree of automation on a model railway, and in this day and age, with electronics, even more so. This article does not attempt to address the subject of electronics in any way. Electronics can be extremely seductive and it is easy to end up spending 90 percent of available modelling time exploring the potential of the microchip! Starting from scratch as a beginner then, layout wiring and electrics should be a means to an end and not the end in itself, the end being to accurately simulate a full size railway system. At this stage it may be worth giving you a couple of points worth keeping in mind. 1. Try to keep the electrics simple. 2. Plan your electrics before hand and make a drawing. You will find that this approach pays dividends when you have to trace faults (and I'm afraid you will). Electrification of a model railway is not difficult nor is it hazardous since it employs low voltages, which are completely safe. It can however damage your precious equipment, if you fail to observe some basic rules and apply a bit of common sense. Having understood the basics of wiring a model railway, I cannot say more than "you will learn to wire a model railway by wiring a model railway". There is no substitute for getting stuck in and having a go. One final point from the safety side. Power sources are usually mains (240v ac) driven and I advise the uninitiated to resist dabbling into this side of the subject. Obviously mains electricity is potentially lethal and should only be looked at by competent people, who are aware of all the regulations. There are lots of commercially available controllers to choose from, so do not attempt to construct your own power supply, elect instead for one of these very reliable and safe units. All electrical equipment comes with a pre fitted 13 amp fused plug, one thing to remember though is, that if a replacement fuse is required, be careful to use one of the same value as the one you remove, this will normally be no more than 3 amps. The majority of model locomotives require a certain kind of electricity to move them, known as direct current or D.C. and for the purposes of model railways comes from a power controller. Most commercially available controllers come with one or two 12volt d.c. outputs, which vary the voltage applied to the rail, by turning a knob on the front to vary the speed of the locomotive. They may have one or two outputs which are not variable (constant 12volts d.c.) to enable a second or third speed control to be added later. There may be switches on the front for reversing the direction of the current, thus reversing the direction of the locomotive, and there should be some devise for protection against overloads or short circuits. There will be other terminals on the rear of the box marked "16v ac" or "Auxiliary". I shall discuss this later in the article. Consider the very simple layout in Fig1. Here you have a straightforward oval, typical of the Father/Son first train set type. Power is fed to the track along two wires, which are connected to the power controller and are normally referred to as Feed and Return. Get used to this concept and try to forget positive wires and negative wires, for each time you change direction (see reverse switch figure 3) on the controller), the polarity of the running rails will be changed. We are of course, dealing with the two rail systems here, where the running rails are insulated from each other; it is simple, effective and virtually trouble-free and nearly universal throughout the hobby. There used to be systems in the early days that ran on three-rail track systems. These are no longer commercially available but are still very much indulged by specialist collectors. Getting back to the two-rail concept, all you have to do now is connect your feed and return wires to the track, switch on the mains power, turn the knob on the controller and theoretically away you should go. Now you need to make it a bit more interesting. If our layout were to stay as in Fig.1 an oval, it would soon become boring. What we need to do is to exercise a bit more control over what happens and thus move towards a more convincing railway. What about adding things such as points and sidings, or the ability to control more than one loco at once. Maybe you would like to provide some means of holding a loco on a dead section of the track. The addition of a few gadgets and tricks of the trade will allow you to achieve this level of control. In Fig.3 I have given you some simple representations of the different types of toggle switches that are available, and what the terminology means. In Fig.4 I have shown you some of the standard symbols you will come across on various layout diagrams given in most books and magazines. It is standard practise to represent both rails of the layout as one single line as it makes life easier. An isolating section - this is no more than a break in one rail and a single pole switch connected across the gap. (See inset at ZZ Fig.2). It does not matter which rail you break, the end result is the same i.e. the section of rail beyond the gap is dead until the switch is made. A double rail break - Here both rails are broken, an essential feature on layouts using live frog points, and also needed where more than one controller is to be used. A feed point - This is the recognised symbol to indicate a feed point. A reverse loop feed point - Reverse loops are another subject which require special attention and I do not propose to discuss these except to tell you that this is a symbol for a feed point on a reversing loop. 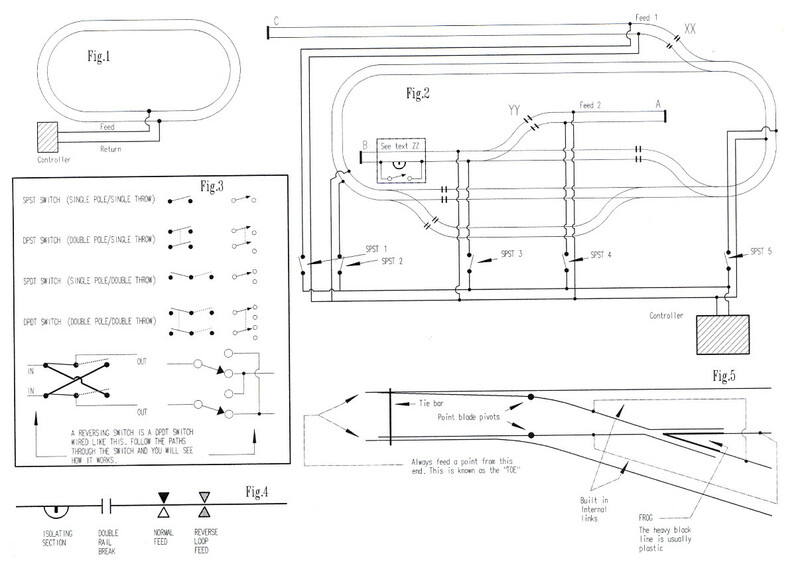 Let us now consider the layout shown in Fig.2 I have included some turnouts or points to the basic oval and also a few SPST switches (SPST 1 - 5). This now opens up a whole different ball game if you use a bit of imagination. For example, sidings A and B could be a goods yard or even a bay on an urban station. Sidings C could be the beginning of a motive power depot or if you want to be more ambitious, some other remote part of your layout like a branch line. The possible combinations are limited only by your ingenuity to create your own personal railway. You may however, decide to model some real location, right down to the smallest detail, but the point of all this is to show you how it impacts on the electrical aspects. First of all, you need to know that there are two different types of points, "dead frog" and "live frog" types. Since this article is aimed at the beginners amongst you I mention this now to warn you that live frogs electrically speaking have to be treated in quite different ways to dead frogs and I do not intend to elaborate further than that. I am going to assume that you will be using dead frog points and leave you to graduate on to live frogs on the wings of experience. From the drawing you will notice that all the feed wires are taken to various points on the layout via a single pole switch and that all return wires are common i.e. joined together. This is always good modelling practice where you are controlling your layout from one controller. The switches enable power to be fed to different sections of the layout and therefore allow you to have more than one loco on the tracks at the same time but only one actually moving. If you also include an isolating section switch (See the symbol at ZZ Fig.2) you will be able to perform simple shunting manoeuvres and park locos or whole trains in station platforms or storage sidings. If you want to control more than one loco at once, then you will obviously require another controller which will need to be added to the system. There are several ingenious ways of doing this and on our layout in Fig.2 I have shown one simple way. By adding double rail breaks at YY and ZZ, you could connect feeds 1 and 2 to a second controller. You now have control over, what is essentially another section of your layout where other locos can be run. There are several other ways of achieving this sort of layout control, about which some very good books are available. This sort of article is not the platform to deal with the subject in any great detail, but I hope to whet your appetite. Always keep feed and return wires electrically isolated from each other and never allow feed and return wires associated with separate controllers to become connected together. If this happens you will have all kinds of problems. It is always a good idea to have a double rail break on any continuous loop, especially if you have facing points or points that are back to back, as on a double crossing or a passing loop. I strongly suggest that any wire you are going to connect to your track for either feed or return are soldered directly onto the rail. Do this by first "tinning" a section of rail where you are going to make a connection and also the pre-bared wire ends. Hold the wire in place and apply the soldering iron to the joint until the solder on the two surfaces begins to run. At this instant remove the soldering iron but continue to hold the wire without disturbing the joint, until the solder has solidified. A good joint will have a shiny silver appearance. Try to use a soldering iron that has a fine needle point as opposed to a flat end, this will make it easier to get the wires soldered into the web of the rail. Do not solder wires onto the inside of the rail, because the wheel flanges will not pass this joint and do not leave great blobs of solder on top of the rail where the loco wheels run. Do remember that most soldering irons get very hot and are capable of doing irreparable damage to the plastic parts of your rolling stock and other equipment; it can also deliver a nasty burn! Keep them well out of reach if you have small children around. If you have opted to purchase a controller of the electronic variety, it is probably a good idea not to attempt any solder connections to the track whilst	a controller is live. It is very possible that you will damage vital components if your soldering iron is not earthed correctly. Electricity suffers from properties known in the trade as "volt drop" and "resistance". Without going into technicalities the resultant effects of these two phenomena on the layout will be seen as the manifestation of unexplained stops and starts or mysterious speed variations in certain sections. One way to minimise the effects is to permanently solder rail joints, i.e. at a fish plate joint. When you are satisfied that the joint will not be disturbed again, run a small amount of solder into the joint on the outside of the rail only and do not simply rely on the surface contact of the metal fish plate. Where you have to make double rail breaks I strongly recommend that you use insulated rail joiners and do not simply leave a gap or take a hack saw to the rail and cut a gap in the rails after they are laid. A single rail break can be made by simply cutting one rail. It is always a good idea however to pin the track in front of and behind the break to provide extra stability. You may now begin to appreciate the advantages of an electrical plan before you start laying the track. When you are taking wires underneath the base board from one position to another, it is good practice to secure or support them from time to time and always leave a small amount of slack just before terminating them. If you can afford the expense of the extra wire it is even better if you can use a domestic wiring type of plastic trunking to try and keep the wiring altogether. Another good idea is to use different coloured wire for different functions. For example, you could use red and black for feed and return wires; white and green for your section switches; yellow and blue for turn out operation. The point I am making here, is that if you adopt some sort of colour scheme to your wiring it will help identify where the wires are going when you have to trace a fault. I would like to conclude this brief introduction to the hobby by discussing the means by which a locomotive changes track. I am, of course, referring to points or turn outs. I have given a diagram of a typical point in Fig.5. Please note that it is meant to be representative of the insulated (dead) frog variety. They can be operated by various methods but for the sake of this short article I am briefly going to discuss doing it electrically. There are devices known as point motors on the market, which are no more than two electro-magnets that operate a common armature. This armature is designed to be mechanically connected to the "tie bar" of the point or turn out. With the application of a suitable electric current to one coil or the other, the armature is made to travel in one of two linear directions. This force is transmitted to the point blades which subsequently change position. At the very beginning of this article I mentioned the fact that some power controllers provide auxiliary terminals. It is not unusual to find that the output from such terminals is in the order of 16 volts a.c. This may be used to connect a slave controller or in fact provide the current to operate your points. Most point motors are quite happy operating at this voltage level, but may tend to be a little sluggish, dependant on the mechanical load that is connected to them. Point motors can be mounted above or below the base board, but whichever you decide upon, make sure that they are very securely mounted, otherwise you may not achieve a positive operation (there is nothing worse than a loco negotiating a point whose blades have not made positive contact with the stock rail; the result always ends up in a derailment!). The emphasis on positive point operation will save you a lot of frustration in the long-term. One way of ensuring this is to employ the use of an electronic (capacitor) discharge unit. This is a device which, for a few milliseconds will give point motors a dose of volts four times that which they were designed for, the net effect is quite a dramatic "whack", absolutely positive and completely harmless to the point motor. Point motors do not like being permanently connected to a source of current as they get quite warm. It is usual therefore, to contrive a method which is only going to connect the current for a brief period, just long enough to achieve operation. This can be done by using a spring-loaded S.P.D.T. switch where the off position is biased to the centre, or by special passing contact switches specifically designed for the operation of points. I hope that I have been able to enthuse you enough to give you the confidence to have a go at model railway electrification. Please understand that this very brief article does not purport to deal with the subject in any great detail. There are many good books available on the subject, full of useful ideas and information. Another way of course is to become a member of a model railway club or society and avail yourself of the plethora of experience that exists in such organisations. Many members of the club have a special interest in the West Coast Main Line, some, indeed, having grown up alongside it. I grew up in Banbury and knew it only from day trips, by train to Bletchley, by bicycle to Roade, or, once or twice a year, by hitching a lift to Wolverton in my aunt's car when she went to see a friend in Newton Blossomville. For some reason, on one such occasion, on 23 August 1956, I kept a complete record of all the trains that passed, from the down 'Royal Scot', which must have been around 11.00 to the down 'Midlander' that passed at about 18.30. The list appears below. Readers will come to their own conclusions about it, but perhaps the most striking feature is the complete absence of diesel traction. An afternoon at Wolverton Station, 23 August 1956. 46236 City of Bradford. Down 'Royal Scot'. 40660 + 45527 Southport. Up 'Shamrock'. 46125 3rd Carabinier. Down Glasgow. 45603 Solomon Islands. Down goods. 46132 The King's Regiment, Liverpool. Down 'Manxman'. 46240 City of Coventry. Down Carlisle. 45737 Atlas. Down Birmingham and Wolverhampton. 46169 The Boy Scout. Up Manchester. 46144 Honourable Artillery Company. Up Blackpool. 70033 Charles Dickens. Up Manchester. 46147 The Northamptonshire Regiment. Up 'Emerald Isle Express'. 46205 Princess Victoria. Up 'Merseyside Express'. 45536 Private W Woods VC. Down Manchester. 45528 (Unnamed) Down 'Lakes Express'. 46142 The York & Lancaster Regiment. Down 'Red Rose'. 45733 Novelty. Up Birmingham and Wolverhampton. 45439 + 45514 Holyhead. Down Birmingham and Wolverhampton. 46134 The Cheshire Regiment. Up Blackpool. 45686 St Vincent. Up Llandudno. 46201 Princess Elizabeth. Down 'Midday Scot'. 40046 Up light (ex-works, Willesden loco). 46148 The Manchester Regiment. Up Carlisle. 45709 Implacable. Down Birmingham and Wolverhampton. 45534 E Tootal Broadhurst. Down 'Manxman'. 45606 Falkland Islands. Up Birmingham and Wolverhampton. 70044 Earl Haig. Down Manchester. 45523 Bangor. Up Barrow and Windermere. 70037 Hereward the Wake. Down Manchester. 46229 Duchess of Hamilton. Up 'Royal Scot'. 46111 Royal Fusilier. Up Manchester. 46151 The Royal Horse Guardsman. Down Manchester. 44831 + 45740 Munster. Up Birmingham and Wolverhampton. 46254 City of Stoke-on-Trent. Up Glasgow. 46106 Gordon Highlander. Down Blackpool. 70049 (unnamed). Up 'Irish Mail'. 46239 City of Chester. Up Perth and Barrow. 46212 Duchess of Kent. Down 'Emerald Isle Express'.